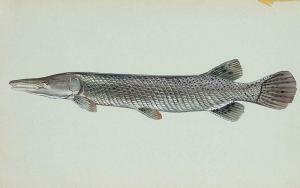 The alligator garfish is my favorite creature that dwells the rivers and lakes of North America. Growing possibly up to 10 feet in length and routinely measuring more than seven feet they are legitimate “River Monsters”. As a child I remember my Dad saying someone should do a gar version of “Jaws” called “Teeth”. To this day, that makes me smile. From the archives of Extreme Wildlife Radio is a show my partner Terri Werner and I did with Craig Bonds, Texas Parks & Wildlife Department biologist Craig Bonds about these unique fish.